HOLMAN, William Steele, a Representative from Indiana; born near Aurora, Dearborn County, Ind., September 6, 1822; attended the common schools and Franklin College, Franklin, Ind. ; taught in the public schools; studied law; was admitted to the bar and practiced; judge of the probate court 1843-1846; prosecuting attorney 1847-1849; member of the State constitutional convention in 1850; member of the State house of representatives in 1851 and 1852; judge of the court of common pleas 1852-1856; elected as a Democrat to the Thirty-sixth, Thirty-seventh, and Thirty-eighth Congresses (March 4, 1859-March 3, 1865); not a candidate for reelection to the Thirty-ninth Congress; elected to the Fortieth and to the four succeeding Congresses (March 4, 1867-March 3, 1877); chairman, Committee on Appropriations (Forty-fourth Congress), Committee on Public Buildings and Grounds (Forty-fourth Congress); was not a candidate for election to the Forty-fifth Congress; elected to the Forty-seventh and to the six succeeding Congresses (March 4, 1881-March 3, 1895); chairman, Committee on Public Lands (Fiftieth Congress), Committee on Appropriations (Fifty-second Congress), Committee on Indian Affairs (Fifty-third Congress); unsuccessful candidate for reelection to the Fifty-fourth Congress; again elected to the Fifty-fifth Congress and served from March 4, 1897, until his death in Washington, D.C., April 22, 1897; interment in Veraestau Cemetery, Aurora, Ind. 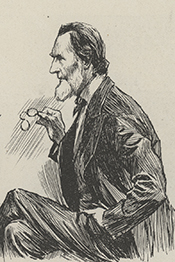 Papers: Holman-O'Brien papers, 1827-1893. 1 box. Chiefly Holman's letters on political and personal business to Cornelius O'Brien, William H. O'Brien, and William D.H. Hunter; also letters to constituents. Described in published guide. Inventory in repository. Papers: 1838-1899. 140 items. Letters from constituents regarding political issues. Papers: 1842-1864. ca. 60 letters. In the Allen Hamilton papers. Concerning family business, national legislation, policies of the Republican Party, and the Lincoln Administration. Finding aid in repository. Blake, I. George (Israel George). The Holmans of Veraestau. Oxford, Ohio: The Mississippi Valley Press, 1943. Holman, William Steele. Post-office appropriation bill--the railway postal service ... Speech of Hon. William S. Holman, of Indiana, in the House of Representatives, Tuesday, March 11, 1884. [Washington: Government Printing Office, 1884]. ------. Reconstruction. Washington: McGill & Witherow, printers, 1864. ------. Right of secession--the impending crisis. Speech of William S. Holman, of Indiana, on the State of the Union, delivered in the House of Representatives, January 16, 1861. Washington: M'Gill & Witherow, printers, 1861. Robinson, James M. Memorial addresses of Hon. J. M. Robinson, of Indiana, upon the life and character of Hon. Wm. S. Holman, (late a Representative from the state of Indiana). Washington: [Government Printing Office], 1897. Sulzer, William. The late Hon. W. S. Holman. Washington: [Government Printing Office], 1897.